Gemporia Use this app as a companion to your TV viewing. View fullproduct details, bid instantly and interact live with the studio.Everyone pays the same lowest price for our limited run auctionpieces. 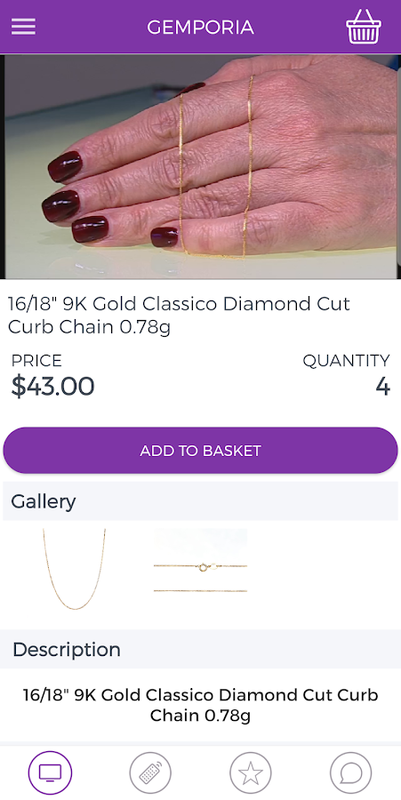 Our brand new Gemporia app makes viewing and shopping withus even easier. See what’s currently live, share your views withthe studio and purchase our limited edition jewelry at exclusiveprices. Enjoy a full screen landscape viewing mode and simplenavigation options. A brilliantly interactive experience, for 24hour access on the move. Download the app now and indulge in ourlatest styles while they last. Gemporia Use this app as a companion to your TV viewing. View fullproduct details, bid instantly and interact live with the studio.Everyone pays the same lowest price for our limited run auctionpieces. Our brand new Gemporia app makes viewing and shopping withus even easier. See what’s currently live, share your views withthe studio and purchase our limited edition jewellery at exclusiveprices. Enjoy a full screen landscape viewing mode and simplenavigation options. A brilliantly interactive experience, foraccess on the move. Download the app now and indulge in our lateststyles while they last. Admire your collection of beautiful genuine gemstone jewelry fromGemporia with the My Gemporia Jewelry app. You’ll find authenticitycertificates and full details of your pieces, all in one place.Every piece you purchase will automatically appear in yourcollection. Download the app now and watch as your collectiongrows. Download the free, easy to use app to use on its own or partnerwith your other Gemporia apps. Featuring the US ring sizes (5 -13), this is the perfect app for uncovering another's ring size,enabling you to surprise a loved one with a special gift. Simplyplace an existing ring over the circle to find your size. Availablefor Android and Apple systems, use this app on your phone ortablet. Download the free, easy to use app to use on its own or partnerwith your other Gemporia apps. Featuring sizes 2 - 30, this is theperfect app for uncovering another's ring size, enabling you tosurprise a loved one with a special gift. Simply place an existingring over the circle to find your size. Available for Android andApple systems, use this app on your phone or tablet. Admire your collection of beautiful genuine gemstone jewellery fromGemporia with the My Gemporia Jewellery app. You’ll findauthenticity certificates and full details of your pieces, all inone place. Every piece you purchase will automatically appear inyour collection. Download the app now and watch as your collectiongrows. Shop for the latest jewelry styles at up to90% off. The best deals in jewelry and fine jewelry. Looking for agift? Look no further.FREE app! Download now!Once you’ve downloaded the app, you won’t want to stop shopping!Bring the excitement of shopping to your fingertips. India’s favourite fashion jewellery destination - Voylla - bringsbeautiful, affordable jewellery at your fingertips! Download theVoylla app today to shop for earrings, mangalsutras, necklaces,bracelets, chains, bangles and more. Over 45,000 designs andcollections for bridal, everyday wear, party, office wear, mehndi,sangeet, birthdays. Why shop on Voylla.com? Shop for your preferredlook/occasion: Bridal, trendy, party and cocktail, spiritual,religious, mehndi, sangeet, office, Diwali, festive, college, datenight and more Shop for your preferred style: Oxidised, antique,dual toned, silver, gold-plated, beads, stones, terracotta, CZ,kundan, polki, meenakari, pearl Shop for your preferred jewellery:Earrings, rings, nose rings,mangalsutra, anklets, chains, jhumkis,bangles, kadas, bracelets, pendant sets Women love Voylla’sstunning variety and affordable prices. Latest styles in maangtikas, bracelets, jhumkis, nose-rings, anklets, pendant sets.Affordable price points, online exclusive offers and promise ofauthentic material and high quality products. Your wedding day isperhaps the one day, that you go on to cherish for eternity, and sois everything that comes in the package- the countless guests,photographs, food that did not come your way and of course, yourattire. And what’s more suitable for wedding jewellery shoppingthan Voylla, your online jewellery companion? We have one of therichest collections of Indian fashion jewelry, available to you, ataffordable, everyday prices! The jewellery here, at Voylla, havesplendid indian jewellery designs that borrow from tradition andcater to the modern.This perfect blend, renders it as one of theformidable giants of Indian traditional jewellery as well as indianfashion jewelry online. Men love Dare by Voylla’s stylish fashionaccessories, hand-crafted with authentic material. Belts, studs,chains, cuffs, bracelets apart, there are hundreds of giftingideas. Pendant Sets, engagement rings, bands, spiritual pendantsand rings come with Voylla’s promise of genuine quality and bestshopping experience. Our trendy designs and sublime blends make ourproducts a viable choice for Indian jewelry in USA. All in all,Voylla is your one stop online store for online Indian bridaljewellery, fashion jewellery Enjoy app-only exclusives - launches,previews, special offers and discounts. Surprise gifts, flash saleand easy delivery, return policy guaranteed. App features SuperEasy To Use! Swipe through thousands of fashion jewellery, latestdesigns for men and women. Shop with discounts, offers, sales,jaw-dropping deals, and fashion tips. Find your match! Applyfilters to sort through our eclectic collection of silver chains,handcrafted jewellery, fashion accessories for men and women, CZrings and earrings, and many more such categories. Find what youare looking for in a jiffy! Look the part! No brand offers such astunning variety to choose from. Wear Voylla to work, on thefashion ramp, to a date, for a party, wedding, dress up as a bride,exchange engagement rings, wedding bands, dazzle on a date! Staytrendy or make a statement. Own the part! The Voylla app featuresDare By Voylla men’s jewellery that men can wear to office, toparties, outings with friends, to the place of worship and on everyspecial or everyday occasion. Bold, trendy, classic or rugged -take your pick of leather bracelets, gold - plated necklaces,chains and rings, cuff links, studs and more. Don’t just wear forthe part, own it! Picture perfect! Virtually and in reality! Zoomin and zoom out of each item in the store. Scan each accessory;thanks to high resolution pictures it is almost like touching andfeeling the jewellery in real. And when you purchase a Voyllaaccessory and hold it in your hands, you realize that what you seeonline is what you get! Send us your valuable suggestions andfeedback on [email protected] or call us on +91 76761 11022.